Imagine your operator seated safely at a workstation with the visibility and power to control the entire operation at their fingertips. With a click of a single button, they can start the plant in a planned, coordinated sequence that automatically controls and self-monitors to ensure the plant spools up as expected. Once running, the operator clearly oversees the entire operation with simple graphics that, in an instant, can show them the status and alert them to potential issues. 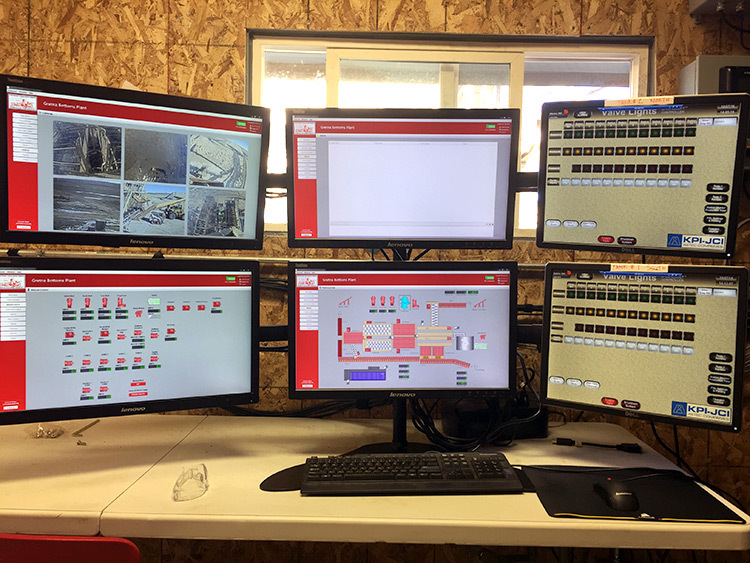 With a blend of integrated cameras, sensors, and equipment, your operator can verify and control critical aspects of production on the fly to keep production maximized. Standardized notifications and alarms help keep consistency between personnel and ensures that critical parameters are kept in tolerance. With the ability to look at trends of operational information, your personnel can make better decisions and maintain control of the operation, rather than constantly reacting to the processes. Once the shift is complete, another click and the plant sequences a shutdown that is always consistent with your operating procedures. As the operator packs up for the day, the system automatically sends you a report summarizing the production by shift, day, or week. Plant Automation can represent one of the most profitable projects an aggregate producer can undertake. Many mining and crushing plants operate from simple start/stop control, and a maze of manual buttons and switches. While this method has been the staple for decades, many producers do not realize the amount of information that is being missed. Does your operation keep production logs on a piece of paper by logging start and stop times? Do different operators run your plants differently, causing differences in sequence of operation or differences in production? Would your maintenance personnel benefit from being able to look back in time when things go wrong to help reduce the time it takes to get your plant back into production? These are just some of the reasons that mines and producers are investing heavily in Plant Automation. At Automated Drive Systems, we have the expertise and capability to provide robust systems for new construction plants, as well as retrofit existing operations. Our systems are designed for each client, not copied and pasted standard function sets. Call us at 402-858-5560 and let’s discuss how we can add value to your operation through plant automation. Learn more about our Plant Automation services.